This article makes three main points. First, The Theory of Democracy Revisited published by Sartori in 1987 remains indispensable reading for all those who want to analyze, criticize, overcome the way representative democracies have come into being and work. Second, no new study has made its appearance capable of superseding in part or in its entirety the contributions made by Sartori. More precisely, neither participatory democracy nor deliberative democracy can be put on the same level as Sartori’s classic democratic theory. Both lack the clarity and the depth comparable to what Sartori has demonstrated in his own critical re-interpretation of democracy. Third, it is well possible to go beyond Sartori’s democracy, but only, in the best scholarly tradition, climbing on the giant’s shoulders. Sartori’s liberal theory of democracy can be improved, especially in the light of contemporary difficulties and challenges, through an in-depth recognition of socio-economic and political inequalities and an assessment of their impact on “real” democracies in order to find remedies. A daunting task. The article uses Sartori’s realistic conception of democracy as a critical tool for discussing recent trends in democratic theory, in particular epistemic democracy and the plebiscite of the audience. Through the years, Sartori dealt with different forms of rationalism while also questioning the idea of a priority the “public” by participatory democrats. Against the former he claimed politics cannot be cleaned of ideologies and passions and against the other argued that institutions and procedures together with opinions and dissent denote democracy. 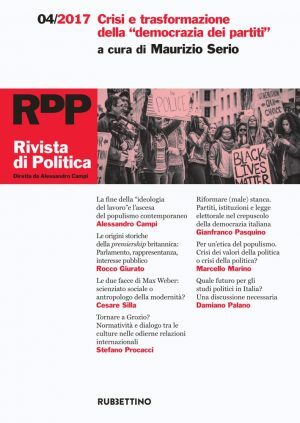 In the vision of democracy elaborated by Sartori what role is played by the concept of the “people”, one of the most ambiguous and controversial of all modern and contemporary political theory? While present-day populism is based on the promise to resurrect its sovereignty within existing pluralistic regimes, Sartori’s democratic theory unfolds in his writings through a liberal-oriented conceptualization of the limits of popular sovereignty. According to Sartori, the concept of the people should be stripped of the romantic, rhetorical and “holy” aura it has often been surrounded by. As this essay will argue, his view rests on the conviction that the very substantial and operational foundation of a democratic system is the public opinion. 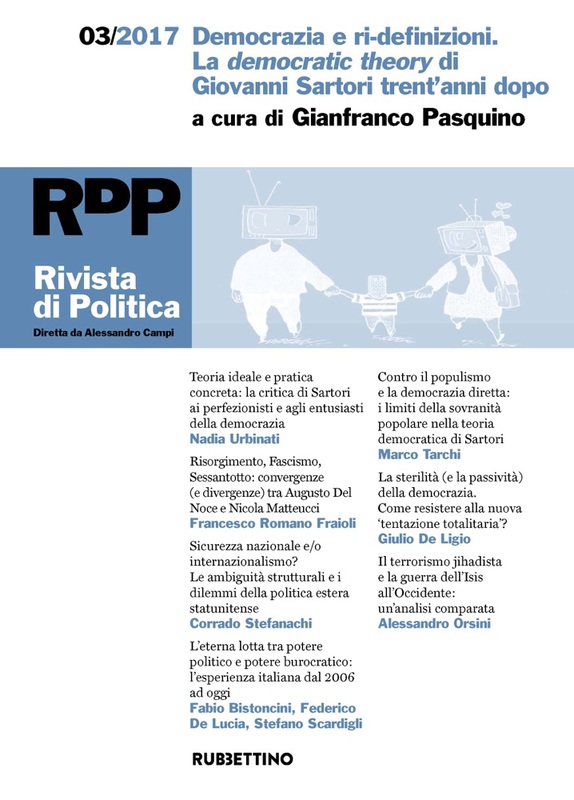 The article analyzes how Giovanni Sartori, in The Theory of Democracy Revisited, discussed what he calls the “new rallying symbol” of the latest theories of democracy: the “participatory democracy”. The first part of the article is devoted to the criticisms that some theorists of participatory democracy (in particular, Peter Bachrach and Carole Pateman) had addressed to Democratic Theory, Sartori’s book published in 1962. Both authors had regarded Sartori as one of the most significant exponents of the “elitist theory of democracy”. In his 1987 book, Sartori carries out a close scrutiny of the theoretical assumptions of participatory democracy, demonstrating how – if one adopts a rigorous definition of it as a “self-government” – a participatory democracy is only possible as a “small-group democracy”. If, on the other hand, such “self-government” is assumed to take place on a large scale, then it would become a “referendum democracy”, which turns out to be a form of “tyranny of the majority” and a form of democracy which would deprive political decisions of any and all epistemic soundness. However, Sartori attenuates the most openly “elitist” tones of his previous work and concludes by saying that «the mainstream theory of democracy has never neglected participation as a concept of personal, active involvement». 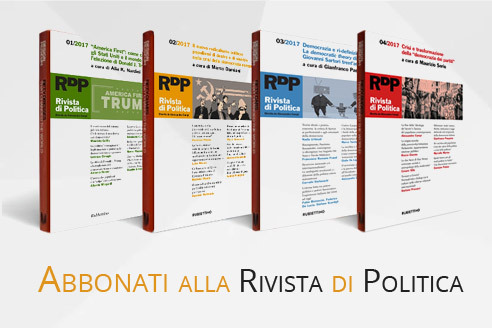 This work wishes to contribute to a line of researches that, for decades, has been investigating the complex relation between politics and the highest ranks of bureaucracy. On this aim it focuses on the Italian situation in the latest ten years (2006-17), concentrating on the “Offices of Direct Collaboration” – i.e. the positions occupied by bureaucrats following a direct political appointment. As such, these offices lie at the exact crossroads between the political power, the Minister, and the highest ranks of the bureaucratic structure headed by the same Minister. 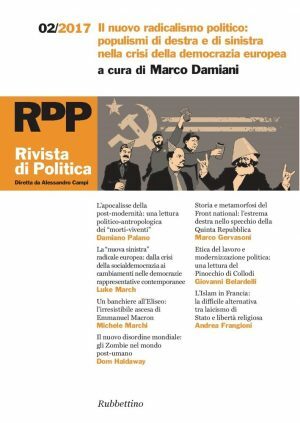 The extensive analysis covers those people who, in the six latest Italian Governments, occupied the Head of Cabinet and the Head of Legislative Office positions, and investigates their administrative affiliation and their ability to be confirmed in their positions, regardless of the political colour of each new Minister. The study, that also resorted to social network analysis techniques, proposes a qualitative classification of Italy’s high-ranks bureaucrats, based on their level of competence and political stance. Since the disappearance of modern tyrannies, it has been widely argued that European nations have found in democracy the “answer” to the question of common life. However, this political regime seems today oriented by a “philosophy” that reduces itself to that very question, since every determination of human life – every “answer” – is said to fatally lead to the repetition of the totalitarian evil. Consequently, a particular conception of democratic debate and experience – what Cornelius Castoradis called «autonomy» – has become the overall criterion of European humanity. “Autonomy”, however, does not allow to distinguish between human practical ends and theoretical alternatives. One must then examine whether autonomy really unfolds and deals with the «question of the law» democracy allows us to raise and human actions always respond to. This possibly vicious circle may imply what we should then call the danger of a democratic closing, a form of contemporary hubris, the source of the sterility of our reasons of being. This paper tries to shed some light on the present understanding of common life in light of the prevailing conception of our philosophical and political post-totalitarian situation. Augusto Del Noce and Nicola Matteucci have confronted each other for about thirty years, at times directly (in the years in which Del Noce collaborated with «Il Mulino»), at others indirectly, on a series of themes of great political and cultural importance. 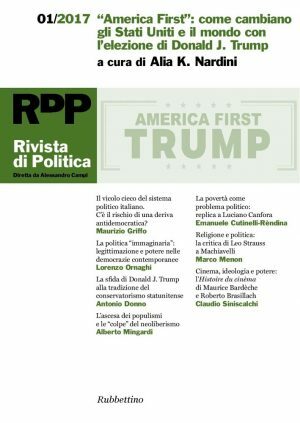 Among these, the limits of the antifascist paradigm as foundation of the Republican democracy, the interpretation of the Risorgimento and the analysis of ’68 events. This confrontation, that also reaches to the evaluation of the Unites States as a model of liberal society, assumes a particular interest for both the intellectual relevance and the different cultural background of the two protagonists (Del Noce, of catholic formation, Matteucci, of liberal-laical culture), besides the importance of the discussed themes. Anyhow, only some of the moments of their confrontation have been until now reconstructed in depth. Purpose of this essay is to fill this gap offering an overall reconstruction, even though necessarily synthetic, of this important chapter of the Italian intellectual history of ’900. Corrado Stefanachi, What do Americans Talk about when they Talk about National Security? The Internationalism and its Ambiguities and Dilemma. The article illustrates the ambiguities of the American “national security” notion on which the United States’ internationalist foreign policy has been premised; the article also highlights the peculiar security dilemma with which American foreign policy has grappled since the United States shifted from isolationism to internationalism. On the one hand, the United States resolved to abandon the isolationist course and to take part to the international power politics on the basis of the assumption that only an active participation to world politics would have made it possible for the Americans to safeguard their way of life, their institutions at home and their identity. On the other hand, the internationalist elite have never ceased to be afraid that the involvement in the world affairs would end up placing too heavy a burden on the United States and putting in jeopardy – as a consequence – that very way of life and institutions which they aimed at preserving through the policy of overseas intervention and engagement. The article states that the search for an effective way to solve this dilemma has been a major part of the American foreign policy from Wilson to Obama. This article analyses and compares all of the terrorist incidents that have been connected to or have been said by reliable sources to be inspired by the Islamic State of Iraq and the Levant in Western Europe from the November 2015 Paris attacks to the August 2017 Catalonia attacks. The authors argues that ISIS was not able to enhance the military capabilities of its terrorist cells in Western Europe. Military capability refers to the type, quantity and sophistication of technology being used in combat operations and the severity of threat to security of the state.